The one thing I always remember about going to Italy with my family was the Al Fresco dining with everyone in the village. We would arrive in our small village up in the mountains, welcomed by relatives from all over the world who make the trek back, as we do, every summer. The little town of 200 (counting chickens and piggies) bursts with extended family to 2000! Everyone so proud to cook for us and share the fresh vegetables, cheeses and wines they have made. I always soak in as many recipes as possible by eye because generations and generations have learned them through osmosis , never writing a word down. Measurements by eye, pinches, handfuls and to taste, of course! The finished product always perfection and food for healthy competition among all the families. I love being a Judge! Anyway, eating outside on extended make shift tables in the beautifully fresh open air of the Campania Region of Italy, debating every topic with do or die passion, is what We have tried to capture for you with our patio and menu on our little corner of Little Italy! Watching friends last night, all come together to share Wine, Carciofi, Aglio Olio, and Meatballs, laughs and tales of crazier times, on a warm night – on the Sotto Voce Patio , It’s why we do what we do. 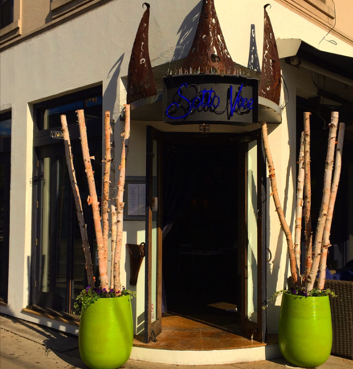 Come be a part of the Sotto Voce Family – 16 years strong!